Tell Me On a Sunday has been performed by the likes of Sarah Brightman, Marti Webb (the original “the girl”), Bernadette Peters, Denise Van Outen, and many more great performers. You can read a really interesting early history of the show over at Wiki. 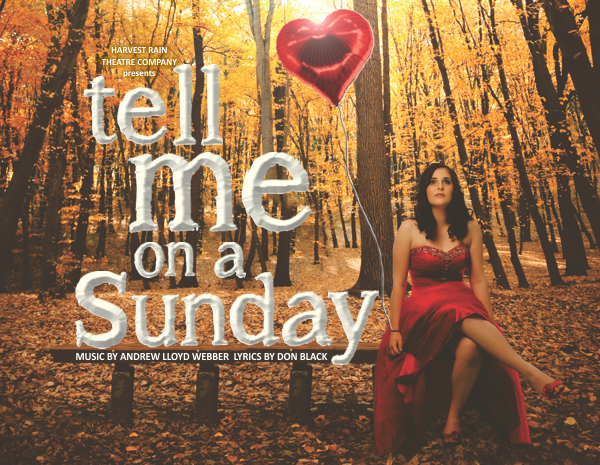 Lloyd Webber’s Tell Me on a Sunday explores the story of Emma; a young English girl from Muswell Hill, tumbling headfirst into a journey towards love and heartache, and discovering self worth and more about her own identity on the way. Directed by Meg Ham, Harvest Rain have packed out the theatre with this latest production and I’m sure will have enjoyed a sold out season. Taking the lead role of Emma is Erika Naddei, a fresh face on the musical theatre scene with a swag of successful performances already under her belt, and it is clear this is one performer to watch. There are singers who are led by the notes on a page, who rely on the ‘money-notes’ to sell a song and equate feeling with nothing other than a good old ‘belt’… and then there are singers who are led by subtleties of text, an honesty of sound and the story they are telling; in Harvest Rain’s production, hot talent Erika Naddei definitely falls into the latter category. With a clear light soprano, Naddei delivers this 50min 1 woman song cycle with vocal finesse and poise, no mean feat seeing as for the majority of the show the character remains in a state of serious lovelorn angst. The opening of the show was played at a highly charged emotional level, and this I felt was a challenging place to begin for the audience. We were given little to no time to get to know ‘Emma’ before watching her unravel, this made it harder to develop empathy for her and restricted the characters growth as the production progressed. I also felt this in evidently caused the journey to plateau in a pretty raw emotional place. This was somewhat alienating, however the demands of this choice were managed well by Naddei whose energy and commitment to character remained strong throughout. I did however find myself wishing for a greater degree of subtlety overall so that the characters journey could be explored with more honesty. Naddei displayed a wonderful ability to engage with the text, skillfully uncovering layers of her character through a delicate and balanced vocal delivery. I really wanted this ‘less is more’ approach taken in the transitions between songs, where the characters ongoing torment/indecision/reflection lacked the integrity of the musical moments. Here I found the delivery to be rather one dimensional, a stark contrast to the honesty present in the songs. The production moved with a steady momentum however, and this made these slightly awkward moments quickly forgiven as Naddei’s vocal continuously brought us back to a sense of truth. Favorites were the beautiful Unexpected Song and the rousing Take That Look off Your Face. The warehouse is such a great space and the theatre had a great sense of intimacy. Set to a backdrop of handwritten letters, packing boxes and a stately staircase alluding to a ‘half empty’ apartment, David Lawrence’s design echoed the sense of transition we see the character living through. Some elements lacked finesse, (hand painted props bug me every time!) Although the ‘wall of letters’ was a great contemporary aesthetic that could have easy been a medium with which the character could engage. An opportunity missed perhaps? Tell Me on a Sunday is a legitimate offering of a classic and widely known work that offers all your favorites packaged just the way you like them. I didn’t feel overly challenged by this production and feel that while seamless, it remained in a nice but very ‘safe’ place. Given the talent of its lead and jam-packed libretto; a smidgeon of grit in the delivery and direction could have taken this production beyond the traditional ‘music theatre mold’ and into something more engaging on a different level. It occasionally falls victim to excess at the price of integrity, but offers up this wholeheartedly and with just enough musical truth to be forgiven. The biggest discovery of the night was the beautiful voice of Erika Naddei and her moments of great musical honesty make me sure of this young performers undoubted future success within the Industry.